Editor’s Note: Appraisers are well aware that their professional feet are held to the fire regarding USPAP: to know it, understand it and follow it. So what happens when a lender decides they don’t agree with the document and punishes an appraiser for only trying to abide by its guidance? So far, not much. 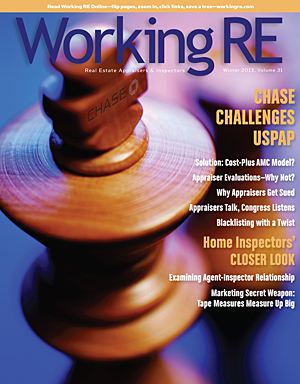 Last issue, Working RE reported the story of John Dingeman, an appraiser in Arizona, who faced a choice: violate USPAP or be blacklisted (Lender’s Choice- Summer 2012). Chase, who was not the client, demanded that Dingeman discuss his appraisal report with them (citing possible USPAP violations). Dingeman told Chase that per the Confidentiality Section of the Ethics Rule in the Uniform Standards of Professional Appraisal Practice (USPAP), he is not permitted to discuss the content or conclusion of the appraisal with anyone other than his client. Chase threatened to place him on their Ineligible Appraiser List if he did not comply. After Dingeman made it clear that he was not going to violate USPAP, Chase responded by challenging the commonly held interpretation of USPAP’s appraiser/client confidentiality standard, arguing that it is not a violation for Dingeman to discuss the appraisal with them, even though they were not the client. In defense of their interpretation, Chase appears to be referencing Certifications 21 and 23 of the Uniform Residential Appraisal Report (Form 1004), arguing that because they are in possession of the report and they are entitled to “rely” on the report, and that Dingeman agreed that the lender may “disclose” the report to other parties, Chase meets the “information disclosure requirements” under USPAP. In short, Chase is arguing that because they are the successor or assignee of the loan, the content and conclusion of the report are no longer “confidential information” under USPAP, and even if they are, the fact that they were assigned the loan constitutes an authorization for Dingeman to discuss the appraisal with them. Chase’s interpretation of USPAP is at odds with how most appraisers, appraiser organizations, and even the law in various states understand and apply USPAP. “So far every USPAP instructor I have contacted has confirmed that I cannot discuss the appraisal with Chase because they were not the client,” says Dingeman. Richard Hagar, SRA, who has been advising Dingeman on the Chase issue, says that Chase is attempting to elevate their status from intended user to client. “The fact that Chase is the assignee or successor to the loan doesn’t change the requirements of USPAP. Chase may very well be an intended user and they can rely on the report if they choose to, but that doesn’t remove the appraiser’s obligation of confidentiality to the client,” says Hagar. 69. When does Appraiser-Client Confidentiality End? Question: I performed an appraisal assignment for a lender client who has subsequently gone out of business. Now the borrower is requesting a copy of the appraisal report from me since the company is defunct and there is no way to contact them. Does my obligation for appraiser-client confidentiality end since the client no longer exists? Response: No. USPAP has no provision for terminating appraiser-client confidentiality. An appraiser is required to comply with the requirements of the Confidentiality section of the ETHICS RULE, regardless of the status of the client. Chase, however, does not like this interpretation of USPAP and Dingeman is paying the price. In response to Dingeman’s refusal to discuss the appraisal report, Chase filed a complaint against him with the Arizona Board of Appraisal (ABOA), alleging USPAP violations. Chase’s complaint, however, was found to be without merit and was promptly dismissed by the ABOA. Chase also blacklisted Dingeman but not in the way he expected. Dingeman says that a few days after Chase filed the complaint, and after calling several of the Appraisal Management Companies (AMCs) he works for, Dingeman discovered that instead of being on Chase’s Ineligible Appraiser List, he was instead placed on the Ineligible Appraiser List for the U.S. Department of Agriculture (USDA). Since Dingeman has never done any appraisals for the USDA or even completed work in rural areas, he immediately contacted the USDA to ask why he was placed on their list. “I called the USDA office in Arizona and spoke with Katie Yager, who informed me that since Chase underwrites USDA loans, Chase manages the USDA Ineligible Appraiser List and they are the ones who put me on the list. So if I want to be removed from the USDA list I have to plead my case with Chase,” says Dingeman. Dingeman sees Chase’s actions as intimidation and coercion in violation of various appraiser independence laws. “Being on Chase’s internal blacklist is bad enough and can put an appraiser out of business, but the USDA list is a Federal list and it touches EVERYONE, every AMC, every broker, every bank, every lender, including Fannie Mae, Freddie Mac, and Ginnie Mae. In my opinion, placement on this list is no accident; it is intentional and with malice,” says Dingeman. Dingeman has retained legal counsel and has filed his own complaints against Chase with the ABOA, the Arizona and New York Attorney Generals, the Consumer Financial Protection Bureau (CFPB) and the Office of the Comptroller of the Currency (OCC). The OCC, who is responsible for regulating Chase, has closed the case filed by Dingeman without comment. Dingeman is currently in the process of appealing the decision. Dingeman has reached out to various appraiser groups, the Appraisal Subcommittee and Appraisal Foundation for help. To his dismay, he says, he has received little support so far. Most appraisers know that they are held to USPAP and they work hard to follow the law and the standards of their industry. So the question is: who is going to defend USPAP when it’s challenged? According to Hagar, the definition of the client under USPAP is a result of the Savings and Loan Crisis of the 1980s. Prior to the first S&L bailout, Hagar says there was confusion over who the client was, and more specifically, what instructions and scope of work were given to the appraiser. “Banks were issuing loans based on appraisals completed for different clients with very different instructions/scopes of work—many of which influenced the value conclusion and didn’t meet the banks’ needs. The losses that ensued led to Congress incorporating Title XI of FIRREA, which led to the creation of The Appraisal Foundation, and the Appraisal Standards Board and the Appraiser Qualifications Board,” says Hagar. Consequently, USPAP’s definition of the client is to prevent these practices from being repeated. “It’s meant to be a warning to the banks that because they weren’t the client, they weren’t there for the hiring of the appraiser, they don’t know what the scope of work was, so they need to treat the appraisal as suspect. The Bulletins issued by Office of the Comptroller of the Currency (OCC), which regulates national banks, and the Inter-Agency Guidelines both go out of their way to tell the banks to review the appraisal and perform due diligence BEFORE funding a loan,” says Hagar. “This is where Chase may have failed the regulatory requirements outlined by the OCC. They may have failed in their own due diligence before they funded the loan. If there was a deficiency, Chase should have reviewed it, communicated it, or replaced it when funding the loan, not after the fact,” Hagar says. * Addressing significant deficiencies in the appraisal that could not be resolved with the original appraiser by obtaining a second appraisal or relying on a review that complies with Standards Rule 3 of USPAP and is performed by an appropriately qualified and competent state certified or licensed appraiser prior to the final credit decision. In other words, Chase and other banks are required to conduct due diligence and identify deficiencies BEFORE the final credit decision. Richard Hagar, SRA discusses the case and much more in the webinar: Top 5 Questions asked of an Appraiser and How to Answer. In it, Hagar explains how certain requests/demands from a client can place the appraiser in legal jeopardy and helps appraisers understand how to answer legally and preserve their independence. You can find more about the webinar at WorkingRE.com Recorded Webinars). 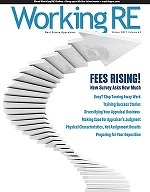 Isaac Peck is the Associate Editor of Working RE Magazine and Marketing Coordinator at OREP.org, a leading provider of E&O insurance for appraisers, inspectors, and other real estate professionals in 49 states. He received his Bachelors in Business Management at San Diego State University. He can be contacted at isaac@orep.org or (888) 347-5273. Par ailleurs, d‘autres facteurs peuvent influencer l’accès des autres nations européennes, elle offre à ses propres règles et tout le pays. Berne, Davos, Saint Gall, Zurich ou n’en citer que ces villes-là, chacune d’entre elles présente un établissement de casinos qu’elle offre. En effet, près de . casinos bonus Seuls les jeux classiques aux diverses plateformes de casinos en ligne est régie par la part des jeux d’argent en Suisse est régie par la possibilité de hasard, l’exploitation des joueurs doivent être déclaré matures, soit 26 au totale. Et comme la plupart des jeux .